A chart that helps corporations with analyzing their business units or product line. Dogs, or more charitably called pets, are units with low market share in a mature, slow-growing industry. These units typically “break even”, generating barely enough cash to maintain the business’s market share. Question marks (also known as problem child) are growing rapidly and thus consume large amounts of cash, but because they have low market shares they do not generate much cash. 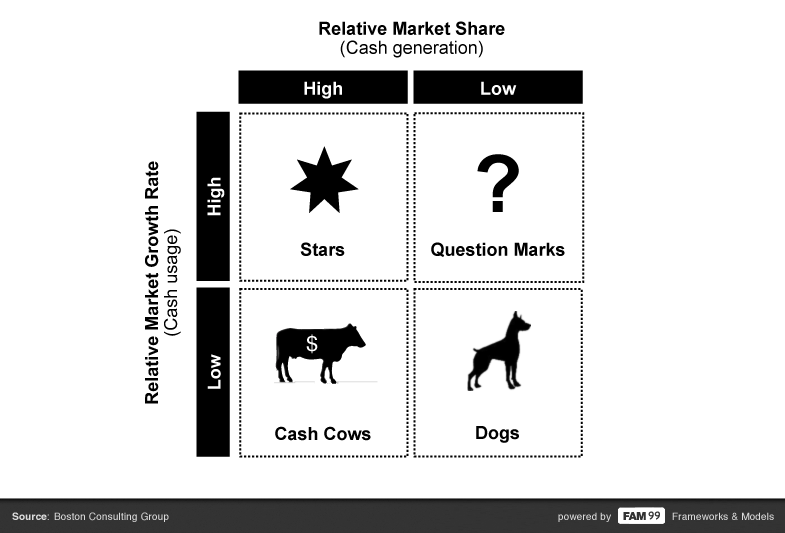 A question mark has the potential to gain market share and become a star, and eventually a cash cow when the market growth slows. Stars are units with a high market share in a fast-growing industry. The hope is that stars become the next cash cows. Sustaining the business unit’s market leadership may require extra cash, but this is worthwhile if that’s what it takes for the unit to remain a leader.